View of Braemar Castle. 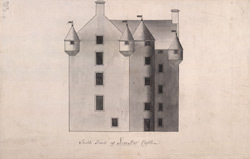 The castle was built by the Earl of Mar in 1628 on the site of an earlier fortification- Kindrochit Castle. Braemar castle has been owned by the Farquharson family since 1732 and has been transformed into a private residence. It is an L shaped castle with an unusual star shaped curtain wall, a central circular stair tower and striking angle turrets with conical shaped roofs. In the mid 18th century the conical roofs were replaced with crenellations to provide lookout more points.